so I finally Facebook outed my year of running for this week’s #TransformationTuesday. 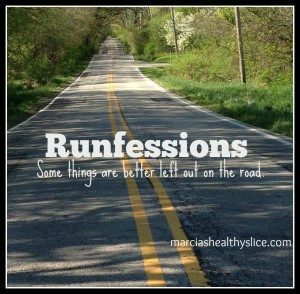 I’ve posted running photos but haven’t really talked about it since I ran the Frozen Penguin. It’s kind of crazy to see the progress I’ve made in just 9.5 months. 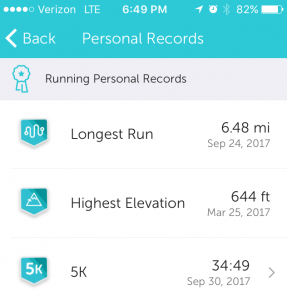 Since my PR run to close September I’ve had some weird runs. 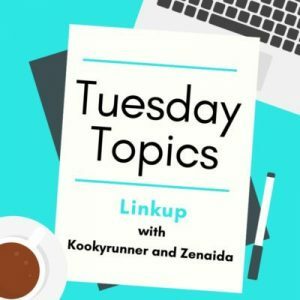 It was partially due to trying to cram runs in before work during a busy window and partially the changing weather wherein we’ve had August in October. The pre-work runs are exacerbated by the East River path being completely torn up. 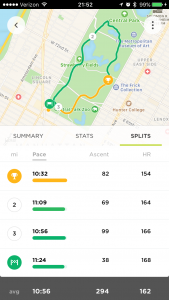 It’s a longer course from 78th to 59th, but it’s such a waste of time to go all the way to the overpass at 78th so I think I’ve settled on going north and hoping the 81st St. overpass is eventually completed. 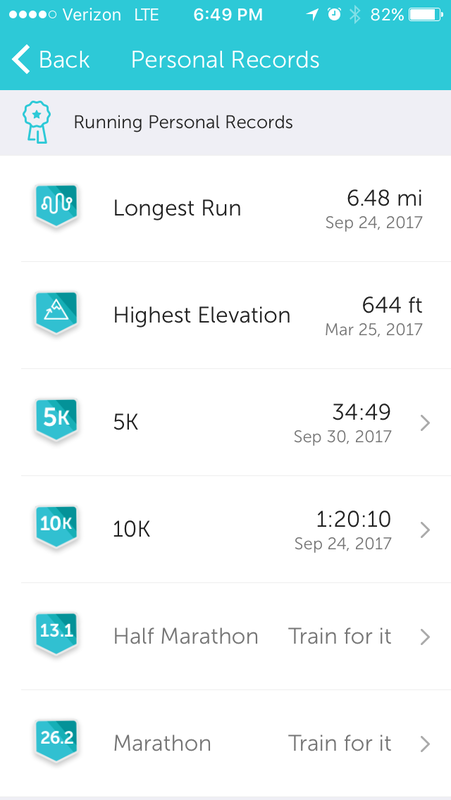 I wasn’t too worried as I know good and bad runs are a thing, especially with the humidity. So I was very happy for this week’s weather turn. Monday and Tuesday had me at the gym but today I escaped the desk while it was still light out and it was a gorgeous, crisp fall afternoon. 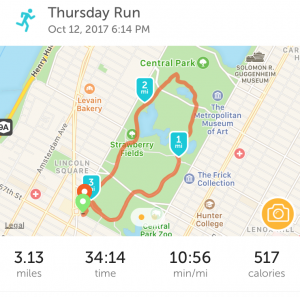 After stashing my stuff at NYRR, I headed into the Park with some vague plans of doing two laps of the lower loop to get in three miles. 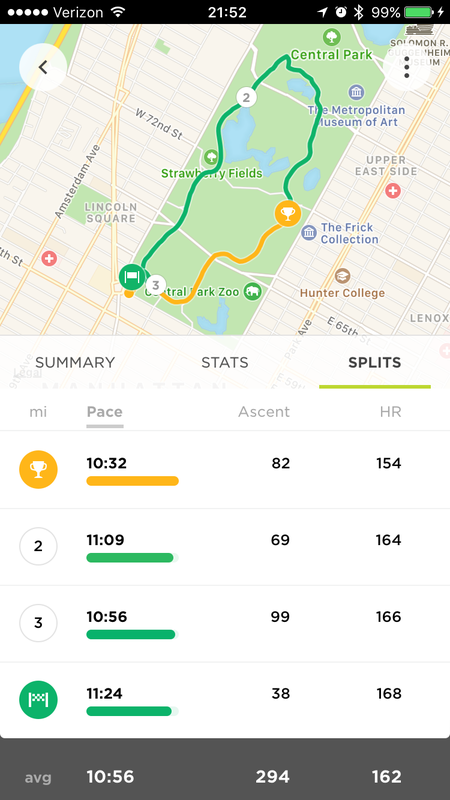 I really don’t like doing laps though, so instead of turning west at 72nd I decided to go up Cat Hill and turn further north at Belvedere Castle. End result? Yep, still a little wiggling at the bottom to get over three miles. Actually felt as if I could have gone farther/longer, but I’d run out of daylight. Park still plenty crowded especially with marathon training, but not enough to do another loop, even of my usual. I was curious how it shook out timing wise as I really couldn’t read my watch in fading light. That’s fifteen seconds off that September run. 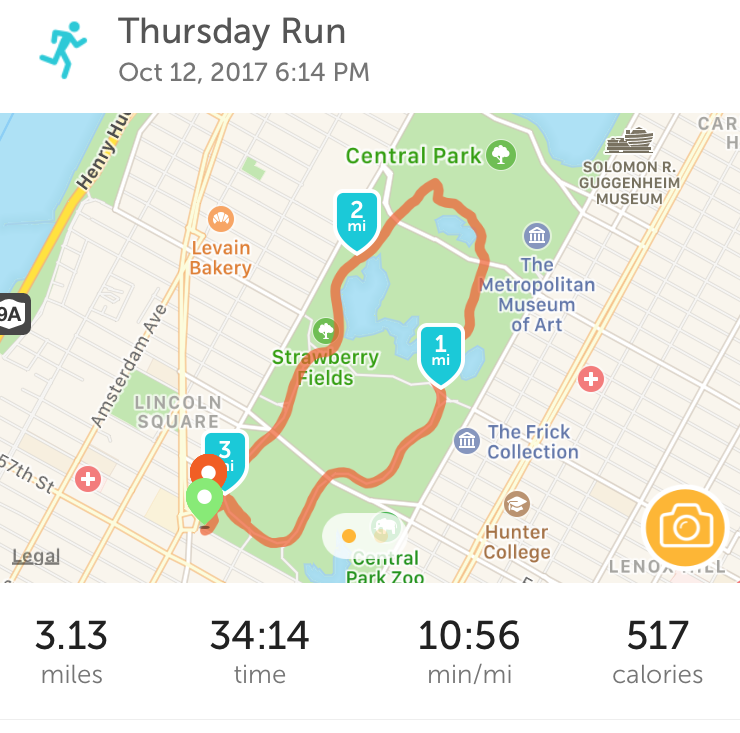 By far my fastest Central Park run, and my first time staying below 11ish on a longer run, and really only the second time ever. 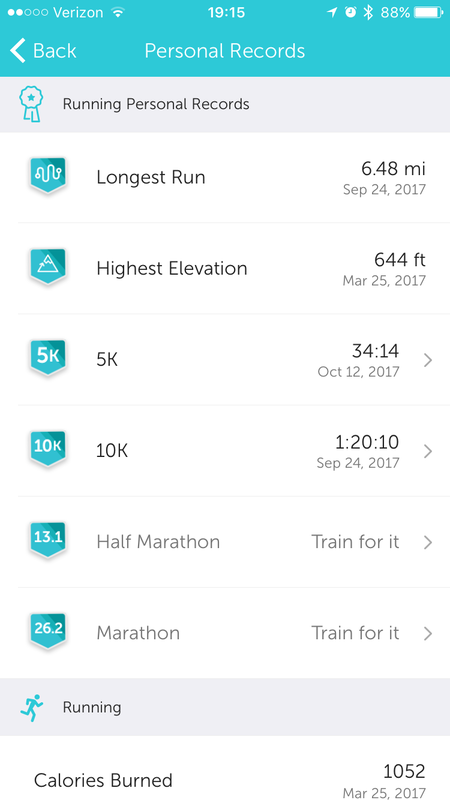 CP is mostly 4x5K on the lower loop and run group on the northern end, but this was my first hybrid of the two since July. I didn’t feel like I was going this fast or this hard, but I think the GPS was pretty accurate. 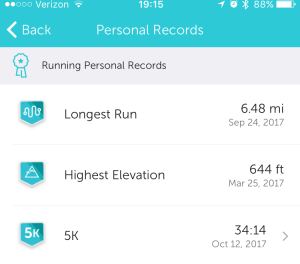 That makes me feel good for my upcoming 5m and some longer long runs I’d like to do with the cooler weather hopefully here. Well done! You’re doing fabulously and I’ve felt privileged to watch your running journey from afar.